72. Brassington and Carsington . 21st August 2014. Parking on the road next to the Midshires Way and heading north west along the trail past Harboro Rocks then left onto the Limestone Way after the bend left then right onto Manystones Lane then left towards Brassington down Kings Hill and Jaspers Lane and straight in to The Miners Arms for a drink. 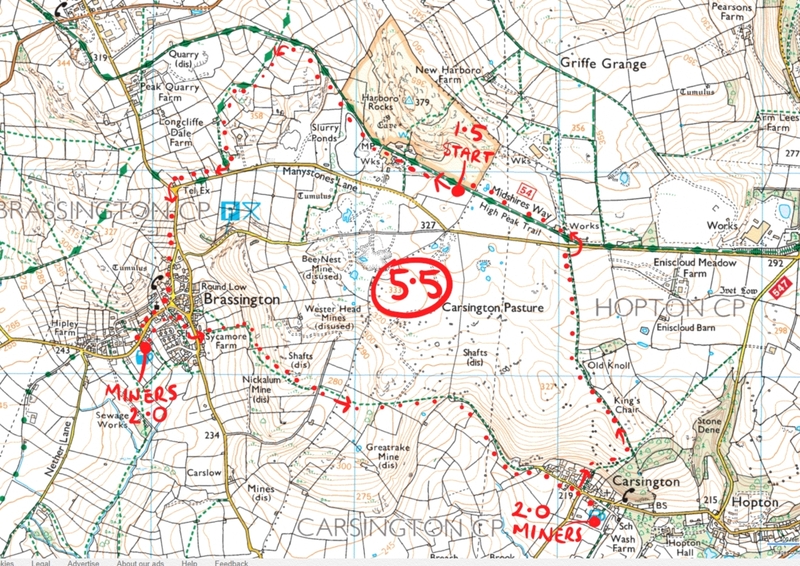 East down Miners Hill then right towards Carsinton and Kniveton then taking a path left between the farms following the path eastwards south eastwards to Carsington. The path leads to a lane and at the sweeping corner taking a left heading northwest skirting the edge of Carsington Wood then north following the wall to sit on The Kings Chair for a brief restbite. Heading north all the way up to cross the main road then right along the Midshires Way again and back to the car.